July 10, 2012 - U.S. Transportation Secretary Ray LaHood and Acting FAA Administrator Michael Huerta on Monday joined federal and local officials in breaking ground for a new, NextGen equipped air traffic control tower at San Francisco International Airport (SFO). "This critical infrastructure project will create good paying jobs in the Bay Area," said U.S. Transportation Secretary Ray LaHood. "The new tower will help us maintain a safe air transportation system for the flying public, and provide economic benefits for the future." According to SFO estimates, the project is expected to create 600 total jobs, of which 400 will be in construction. "As we modernize the airspace system through NextGen satellite technology, we also have to modernize our facilities to ensure they meet the highest safety and performance standards," said Acting FAA Administrator Michael Huerta. "Air traffic controllers will have unobstructed, 360-degree airfield views, a facility constructed to the modern seismic standards and the most up-to-date equipment." 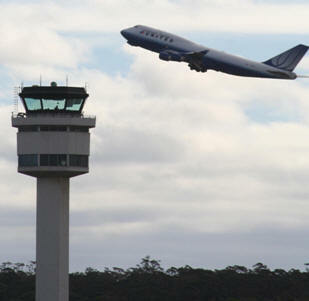 The new control tower will be located between Terminals 1 and 2, south of the existing tower. It will be 221 feet tall with a 650 square-foot controller work area. The project will include a three-story, 44,000 square-foot base building, which will house administrative offices, computer equipment, a backup generator and secure corridors that will allow passengers to transit between terminals without permitting access to the tower. The current tower, which the FAA commissioned in 1984, is 190 feet tall and has a 525 square-foot controller work area. "The construction of SFO's new air traffic control tower will provide the airport with the most technologically advanced facility in the nation," said San Francisco Mayor Ed Lee. "We are investing in our city's critical infrastructure, providing a top-notch international airport and putting our residents back to work." Under a partnership with the airport, the FAA will pay up to $69.5 million toward the project's cost and SFO will supervise the design and construction work. The airport will pay additional costs associated with integrating the tower into the terminal structure, as well as related terminal improvements. The total project cost is expected to be about $102 million. "San Francisco International Airport is extremely pleased to be partnering with the FAA on the construction of this landmark facility," said Airport Director John L. Martin. "The new air traffic control tower will not only meet or exceed the strictest seismic standards and contain the latest technology, but it will also be an iconic symbol of the airport for generations to come." The new tower will be constructed using recycled building materials and will feature state-of-the art environmental elements including reflective roofing, an electric vehicle charging station and energy efficient mechanical and electrical equipment. The FAA expects to start using the new facility in late 2015. SFO was the nation's 15th busiest airport in 2011 with about 404,000 takeoffs and landings.